The work of psychiatry has always revolved around the twin imperatives of care and custody. In an older model of psychiatric power, confinement and coercion were accomplished through isolation from society. The asylum became the ultimate symbol of such power. It arose in the long historical process Foucault termed “the great confinement,” and it reached its ultimate expression in the “total institution” exposed by Goffman in the mid-20th Century. As the landscape of mental health shifted, anthropological attention turned away from the asylum to focus on other topics: psychiatry’s contribution to social control in the neo-liberal state, as practices of governmentality (Foucault 2012), new technologies of the self (Rose 1996) and pharmaceuticalization and the global health movement (Biehl and João 2011). Constraint nevertheless remains a common practice even in our post-asylum era. This special section of Culture, Medicine, and Psychiatry examines contemporary tactics of psychiatric constraint through studies of mental health settings in the USA and France. The four papers connect abstract arguments about disorder, ethics, and subjectivity to the rough edge of practice, where the interests of clinicians and patients most sharply diverge. The mandate not only to treat people but also to control them has produced diverse practices of constraint and on-going struggles about their legitimacy. The authors here take up constraint as a therapeutic value, social logic, work routine, and a challenge to the moral self-regard of front-line clinicians. This article investigates the ambivalence of front-line mental health clinicians toward their power to impose treatment against people’s will. Ambivalence denotes both inward uncertainty and a collective process that emerges in the midst of everyday work. In their commentaries about ambivalence, providers struggle with the distance separating their preferred professional self-image as caring from the routine practices of constraint. A detailed case study, drawn from 2 years of qualitative research in a U.S. community psychiatry agency, traces providers’ response to the major tools of constraint common in such settings: outpatient commitment and collusion between the mental health and criminal justice systems. The case features a near-breakdown of clinical work caused by sharp disagreements over the ethical legitimacy of constraint. The ethnography depicts clinicians’ experience of ambivalence as the complex product of their professional socialization, their relationships with clients, and on-going workplace debates about allowable and forbidden uses of power. As people articulate their ethical sensibility toward constraint, they stumble over the enduring fault lines of community psychiatry, and they also develop an ethos of care tailored to the immediate circumstances, the implicit ideologies, and the broad social contexts of their work. This paper examines the uncertain meaning of confinement in psychiatric care practices. Investigating the recent expansion of high-security units in French public psychiatry, for patients with dangerous behavior (units for difficult patients) and for suffering prisoners (specially equipped hospital units), we aim to understand psychiatry’s use of confinement as part of its evolving mandate over suffering individuals with violent behavior. Although historically the epicenter of secure psychiatric care for dangerous individuals shifted from the asylum to the prison, a review of public reports and psychiatric literature demonstrates that psychiatrists’ attempt to reclaim confinement as part of therapeutic practice underpinned the recent development of new units. Institutional-level analysis emphasizes psychiatry’s enduring concern to subordinate social defense motives to a therapeutic rationale. Analyzing local professionals’ justifications for these units in two emblematic hospitals, the paradoxical effects of a security-driven policy arise: they allowed the units’ existence, yet prevented psychiatrists from defending a genuine therapeutic justification for confinement. Instead, professionals differentiate each unit’s respective mission, underlining the concern for access to care and human dignity or defending the need for protection and safety from potentially dangerous patients. This process reveals the difficulty of defining confinement practices as care when autonomy is a core social value. Based on extensive ethnographic research in psychiatric custody for adolescents, this article uses the creation of, implementation of, and resistance to a treatment model to reveal issues of constraint in American psychiatric treatment. The treatment model is called Counter Response. As a model Counter Response shifts the treatment focus in a total institution for mentally ill youth from the youth themselves to the staff response to the youth. This article uses Counter Response as a case study to illustrate the close ties between constraint and autonomy in psychiatry. It also shows how models like Counter Response reflect the power of unregulated treatment paradigms in American adolescent institutional psychiatric intervention. Finally, the article demonstrates that resistance to Counter Response reveals a tension American practitioners have with psychiatry’s constraining power. This article uses narrative analysis to understand how mental health professionals working in a pilot experiment in community psychiatry in France between 1960 and 1980 made sense of their work experiences. Based on a collection of essays written by these professionals as part of their training as well as on other archival materials, the article explores writing practices in post-war French psychiatry as ways of constructing and negotiating moral commitments to work. The first three sections of the article give some background on mental health nursing in France in the immediate post-war period. The subsequent three sections examine how the professionals elaborated on their experiences in their writings, focusing on three different levels: first, the narrative voice used in the essays; second, the learning processes described by trainees; and finally, the ways in which they negotiated discursively the requirement to do emotionally well at work. “Psychiatry with teeth”: with just three words, a head psychiatrist in Lyon, France, captures the confined spaces and internal discipline of a new type of intensive treatment center for “difficult patients” (Velpry and Eyraud 2014). His pithy phrase provides a vivid yet disconcerting image for the ‘rough edge’ of psychiatry where, as the editors of this issue of Culture, Medicine, and Psychiatry devoted to emergent forms of care and control remind us, constraint and coercion signal a fundamental division between patients and clinicians1 (Velpry and Brodwin 2014). …As the editors announce in their introduction, the twin imperatives of care and confinement, cure and custody, have always defined psychiatry. Why then focus particularly on France and the United States? And what, precisely, is emergent today? Seaman A. The Practice of Constraint in Psychiatry: Emergent Forms of Care and Control — A special issue of Culture, Medicine, and Psychiatry. Somatosphere. 2015. Available at: http://somatosphere.net/2015/the-practice-of-constraint-in-psychiatry-emergent-forms-of-care-and-control-a-special-issue-of-culture-medicine-and-psychiatry.html/. Accessed April 24, 2019. Seaman, Aaron. 2015. The Practice of Constraint in Psychiatry: Emergent Forms of Care and Control — A special issue of Culture, Medicine, and Psychiatry. Somatosphere. 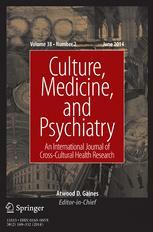 http://somatosphere.net/2015/the-practice-of-constraint-in-psychiatry-emergent-forms-of-care-and-control-a-special-issue-of-culture-medicine-and-psychiatry.html/ (accessed April 24, 2019).